National Sales Director Kristin Sharpe is the daughter of Senior National Sales Director Connie Kittson. Prior to Mary Kay she was a National Leadership Consultant for the author and speaker John C. Maxwell. Kristin started Mary Kay in June of 2006. She became a Red Jacket in her first 2 weeks AND in her first month in Mary Kay, her team production was over $10,000 wholesale. Kristin earned her first Mary Kay car after being in the company only 3 months and became a Sales Director only 4 months after signing her Beauty Consultant agreement. Kristin is currently one of the fastest women to ever become a Sales Director in Mary Kay history. She earned 3 cars in her first year and is currently driving her 9th career car, the 2018 PINK Cadillac Escalade. 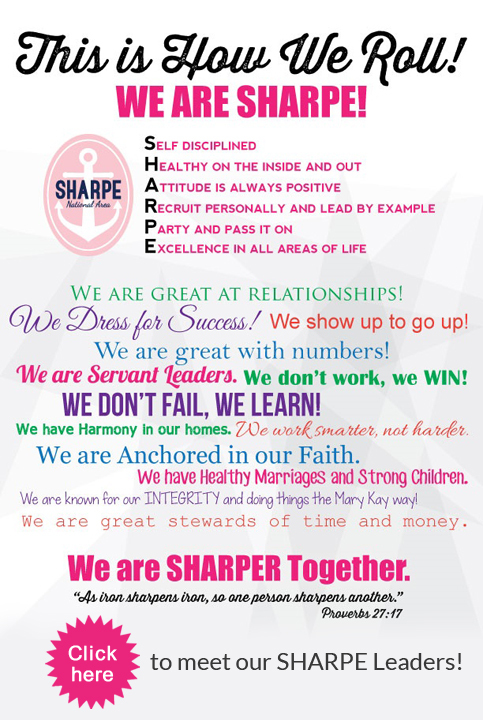 Kristin has been a Star Consultant every quarter since she’s been in Mary Kay. Kristin broke another Mary Kay record by being the first Director to achieve a Triple Star by completing Queen’s Court of Sales, Queen’s Court of Sharing AND Unit Club in less than 9 months in the company. Kristin is a 7 time Triple Star Achiever (Completing the National Court of Sharing, Sales and Unit Club 7 years in a row). Kristin’s YES! Unit has achieved a Unit Club every year. She was the #2 Director in North America in 2013 and the #1 Director Worldwide in 2014, reaching over $1.25 Million in Unit Retail Sales. Kristin was the Queen of Sharing for the entire Diamond Seminar in 2012. She was also the Queen of Unit Retail Sales of the Diamond Seminar 2 times (2013 & 2014), twice as a Million Dollar Director. Kristin has been in the Top 20 of the Court of Sharing 4 times Nationwide. She was a Top 10 Director Nationwide 4 times. She has earned over 100 carats in diamonds, as well as six luxurious trips with her husband, Courtney, to the Greek Isles, Turkey, Hollywood, Maui, Hawaii, Provence, France, Monaco, London, China, San Francisco, London, Paris, Argentina and Rome. Her highest commission check in one month is over $35,000. She is most honored to be selected as the September 2011 Miss Go-Give, the most coveted award in Mary Kay. Kristin is also proud to the be 10th Mother Daughter NSD Team in the Company’s 55 year history, with her Mom, Senior National Sales Director Connie Kittson. Kristin is the honored leader of the YES! Unit and the proud NSD of the 4 time, Gold Circle, SHARPE National Area that is made up of 20 Sales Directors and over 2,400 Beauty Consultants. Kristin loves sharing this opportunity because no matter if you are single or married, a college student or retiree, a stay-at-home mom or a corporate executive, Mary Kay’s flexibility allows it to fit and enrich your life in ways you’ve only dreamed of! Kristin is married to her husband Courtney and they live in Sugar Hill, GA with their son, Luke.